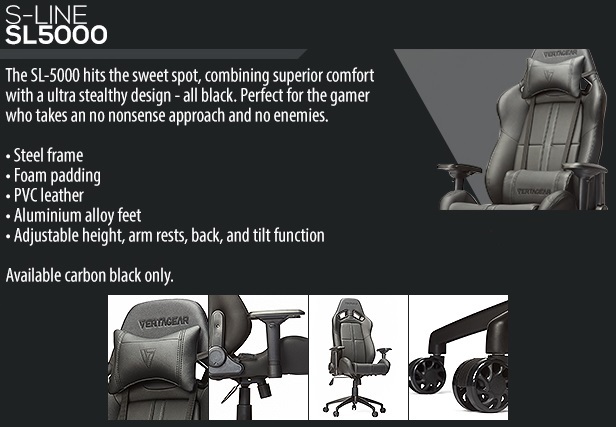 A gamer’s delight, the Vertagear Racing Series S-Line SL-5000 gaming chair will hit the sweet spot for extreme gamers. Racing inspired design, the SL-5000 empowers the gamers’ everyday gaming with the right features. Instantly-recognizable style lets the world know how serious you are about gaming. The SL5000 is constructed from a steel frame that assures a solid structure. The aluminum alloy 5-star base keeps the chair solid, stable and lightweight. Assembled with a Class 4 gaslift, for better durability and ease of use. Our Class 4 Gas Lift has thicker walls to accommodate the higher pressure and stability.